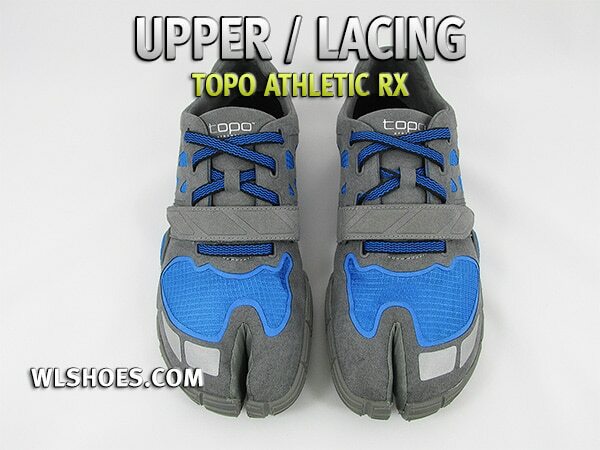 Topo Athletic, a new company in the minimalist shoe market, just released its first line of split-toe athletic shoes and was kind enough to send us a test pair of the Topo RX model. This particular model is aimed at functional fitness type workouts including CrossFit. The men’s model is designated as the M-RX and women’s as the W-RX. Founded by and cleverly named after Tony Post, Topo shoes incorporate many aspects of what Tony learned while working as CEO of Vibram FiverFingers USA. The company’s goal is to take a modern, sensible approach to design and improve upon those that came before them. Sound reasonable enough, but is the split-toe design a more functional shoe or just marketing hype? Well that’s what we’re here to find out. 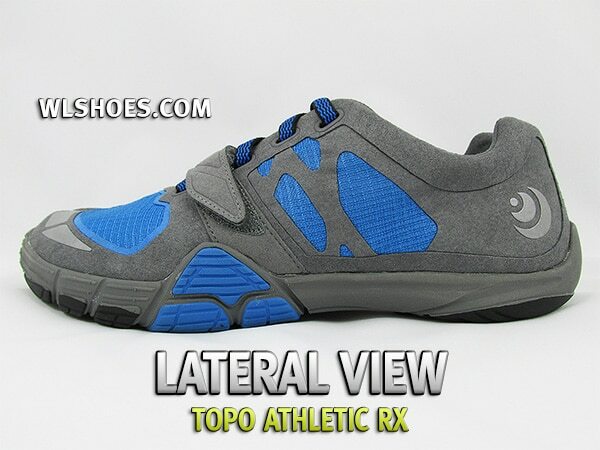 Relying heavily on a Japanese design called tabi shoes, Topo split-toe shoes have an exclusive forefoot anchor point that the company claims offers a better connection to their footwear and more security. The idea is with the big toe given a dedicated “pocket” to move independently, you can better capitalize on your foot’s natural design. Of course, the split-toe design isn’t new at all. A Japanese company, Onitsuka, which is now owned by Asics, offered shoes inspired by tabi in the 1950s. Well-known runner Shigeki Tanaka actually wore those shoes to win the 1951 Boston Marathon. Still, the shoes never caught on with the public and were discontinued. 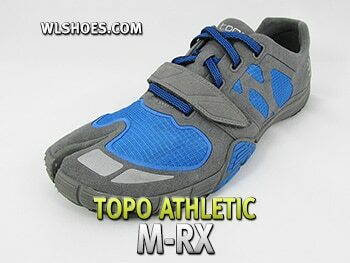 Fast forward to 2013 and Topo is attempting to revive this lost “ninja-toe” design. 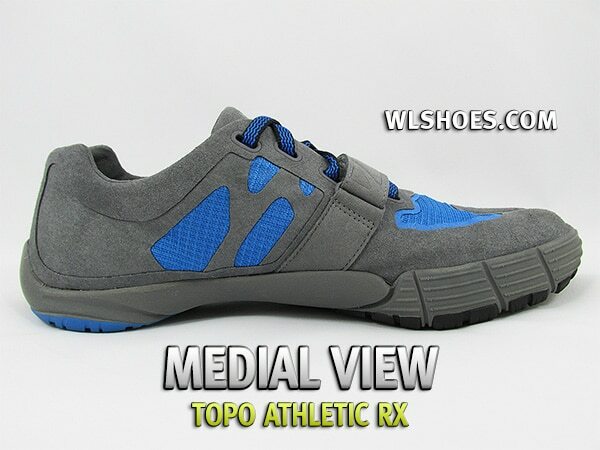 The company currently offers three different models – I chose to review the Topo M-RX, created for what the company calls functional fitness but obviously vying for the attention of the CrossFit crowd. The other two models are running shoes; one intended for frequent running (the RT model) and the other a light-weight race shoe (the RR model). For starters the shoe is SOLID. I was very impressed with the overall quality of construction and the feel of all the materials used. My pair had no bad stitching, excessive glue or mis-aligned parts and it looked ready to rock right out of the box. The shoe strings were a good length, the strap wasn’t too long or too short and you could tell there was no lack in attention to detail. That’s a good start. The upper on the RX model is comprised predominantly of a suede-like material with mesh across the toe-box and down the sides of the shoe for breath-ability. I found both materials to be durable and comfortable on the foot. The breathing system works well and after several hours in the gym my feet were hot but not a sweaty, swamp-mess. This model also feature a single strap across the instep of the foot, not a common feature on this type of shoe but a welcomed addition. Instead of being superfluous flair the strap does exactly what you would expect (and want) it to do, improve lateral and medial stability of the shoe. That’s side-to-side for those of you unfamiliar with foot anatomy. The opening of the shoe is cut low enough to not hinder your ankle or foot flexion and the tongue is thin and stays put fairly well. The shoe also has several reflective pieces on the rear, outside heel and across the toes. I don’t think you’ll be doing a lot of night running in these but it’s a nice nod to safety consciousness. The seams inside the shoes are heat-welded which makes sense. It cuts down on chafing and also helps keep the weight reasonable. While the shoes feel ok without socks, Topo does offers some tabi-toe socks made in conjunction with Injinji. Keep in mind that your old five-toed socks will work as well! Everything inside is constructed of the same continuous piece of a suede-like material that comprises the upper with the exception of the mesh over the toes. The footbed is made of 3mm of EVA and can be removed if needed. The outer or sole of the shoe is made of 4mm of rubber over 6 mm of EVA midsole. This double density design creates a stable yet cushy surface strong enough for lifting but gentle enough for plyo movements. The outsole stretches up about a half an inch around the entire shoe and provides reasonable protection to the toes for burpees and box jumps. So the shoe is made well and has a lot of the features we’d look for in a good trainer but how does it perform? Well… this is where Topo started to lose me a bit. While the heel is the same height as the front, making it a true zero-drop shoe, I somehow felt as though I was leaning backwards while wearing these. This isn’t something I’ve ever noticed in any of my other zero-drop shoes so I’m not sure the cause but I definitely feel like the ball of my foot is higher than my heel. This didn’t create any issues but was something I had to adjust to. Since the shoe is being promoted as functional trainer, stability is a key issue and I could find no fault with the Topo in that category. The relatively thick stack height of 13 millimeters and zero-drop design results in an impressive “planted” feel for a trainer. Unfortunately this also leads to the shoe feeling “clunky” on the foot. While wearing the RX model I did notice a good sense of power off the ball of my foot and the locked in big toe does contribute to this. 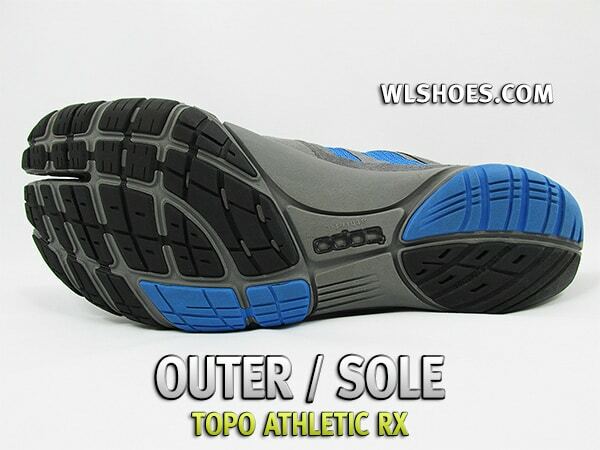 Overall agility felt somewhat diminished though due to the increased sole thickness and the weight. These aren’t heavy shoes by any means, but they aren’t as light as VFFs either. Case in point, I managed to trip over my own foot once or twice and kick a few things when I first started wearing these. And no, they aren’t too big. The issue is that this shoe has much less sensory feedback from the ground than what you would find on a thinner shoe – but that is the cost of the increased stability. You’re also not going to take these on a run, not something they are designed for anyhow. In short, these are much better suited for workouts requiring stability of your foot and fewer quick footed movements – think WODs with a lot of lifting or slower resistance cardio like sled pushing. They definitely perform better for lifting than Vibram or Merrel shoes as you feel more locked-in like you were wearing a pair of lifting shoes. 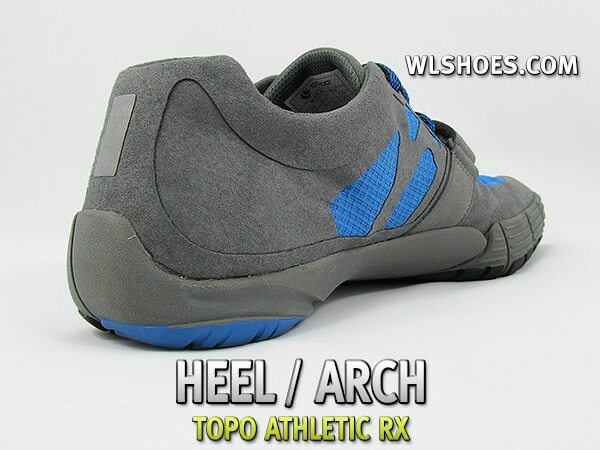 I didn’t try these for rope work but the arch area does have a significant amount of material at the sole. ’m not sure how the upper would hold up after repeated descents though. Jumping rope felt good; you can feel the EVA midsole provide just a bit of cushioning for each landing. And unlike wearing VFFs, the rope doesn’t get stuck between your toe if you miss a jump! I’ve tried lots of different minimalist and zero-drop shoes since they first started making waves. I found these to have a narrower feeling toe box despite how they are advertised – keep in mind I have a wide foot. The width certainly wasn’t unbearable and I’m sure they’ll fit fine for anyone with a normal width foot. The heel cup is noticeably scalloped with a narrow fit which felt great. I never experienced any slipping of my heel all the time I wore these. The arch support is what I’d consider medium/average, although it felt like there was more support towards the ball of my foot than my middle-arch. Having flat feet, I prefer the support to hit me either right in the middle of my arch or closer towards the heel. Chalk that up to personal preference. With your big toe locked in, your remaining toes are able to spread out naturally thanks to the anatomically designed toe box. As detailed this leads to great stability and better-than-expected control off the ball of the foot. In Nike, Adidas and Reebok I wear a men’s size 9 US. I ordered the same in the Topo and it fits perfect. The Topo RX is a great gym trainer and would work very well for your average gym-goer; I certainly wouldn’t hesitate to recommend them to most people I train. But when it comes to CrossFit and that style of varied movement training, I think there are better options already on the market. Personally, and without even wearing them myself, I think the RT and RR models will be better received. I base this on the fact that the split-toe design DOES work to increase power and agility and I think runners will appreciate this feature more so than the “functional fitness” crowd. Since the brand is new to the market, there aren’t a lot of vendors carrying them just yet. Currently the only place I found them were a few online specialty shops that focus more on minimalist and zero-drop shoes. 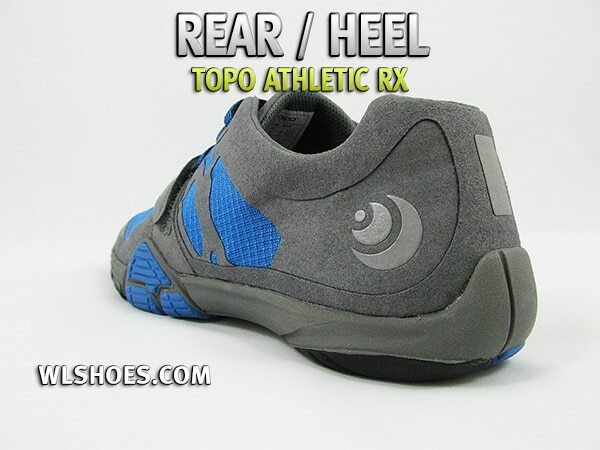 Of those online stores I think the best place to buy the Topo shoes is going to be at BorntoRun.com. They carry a large variety of shoes at competitive prices and have excellent customer service.